Sports gambling is illegal in Texas, except at race tracks (where it's only legal on horses) so I don't really bet except when I'm back in Europe, but if I did I'd have had money on Spurs, so I'm kind of glad. Was watching Club America against Club Leon this weekend and for the second half they had a female main commentator. (This was on Univision, a Spanish-language channel.) I can read Spanish perfectly well but listening to it is another story - because they speak very quickly I can only get around half of what they're talking about. With that qualification, I think she did extremely well, arguably better than the male commentator for the first half. I do wonder how the culturally Mexican audience will react to this, given that it's still quite a macho country (I work with a Mexican guy who calls the women in his department 'chicas', or girls, during meetings and conference calls, which an Anglo-American these days wouldn't generally do) but I'd happily listen to her commentate on a game again. Goal originally given, then the referee backtracks and disallows it (correctly) for offside. Bearded fellow is PAOK's president, who was so incensed at the (again, correct) decision that he came onto the pitch, waved his players off, and challenged the officials. While doing this he took off his jacket to reveal that he had a holstered handgun. To be clear, open carry is legal in Greece and at no time did he produce or even touch the gun, but this managed to shock even the Greeks. The Greek government has now suspended the league. PAOK and AEK are distant rivals. Both are refugee clubs (the K is for Constantinople) founded by Greeks fleeing Asia Minor after Turkey took what is now Istanbul, and there's also the capital vs. second city dimension. He appears to be touching the gun/holster in the first minute of the video. Leaving the Helen Lovejoy-esque report to one side, this can be safely filed among the many examples of why 'the Cappielow boo boys' don't actually represent the most demanding or negative fanbase in world football, as shrill happy-clappers would have us all believe. The still image just shows him with his hand slightly behind his back - it's telling that there's no moving image to that effect. I really don't think he went for it at any time or even really touched it. Grazed it, maybe. Not that I'm defending it. He had no need to take off his jacket. He's a 'businessman' of Russian descent so I'm not surprised that he carries a gun and has a bunch of bodyguards but there was no need for any of this. France has had a real hooligan problem for years now and Lille are a traditionally major club in dire straits, so I'm not surprised to see this. Doing so after a 1-1 draw at home to a decent side like Montpellier is pretty funny, though. I remember years ago PSG used to have hooligan groups fight each other, rather than the opposition. There was the largely white French Boulogne Boys and the largely Magrebhi Mystic Tigers. First of all, a hearty LOL at Jose Mourinho. 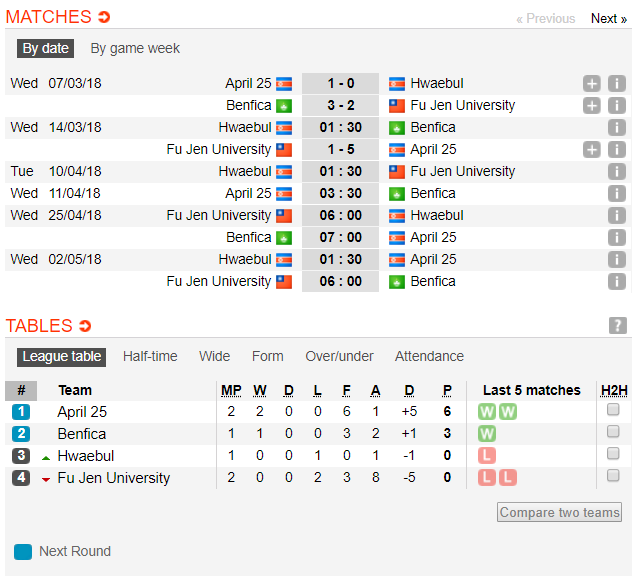 Benfica played Hwaebul this morning but there is no result yet from behind the iron curtain. And yes, that's Benfica... of Macau, a former Portuguese colony. There are Benficas in all the former Portuguese colonies, most notably in Angola. There's also a Benfica in London. edit: according to the AFC Cup official Facebook page, Benfica won but they didn't give a scoreline. Edited by TRVMP, 14 March 2018 - 07:59 PM. what type of gun is that? an AEK-47? Strange to think he is the Greek version of DDFR. He said tweeps - deserving of a missile aimed at his house. It's a two-legged affair but let's face it, it's over. Gremio (Portuguese for 'Guild'; Ronaldinho's boyhood club) absolutely beasted Internacional 3-0. Interestingly (as you can see) Inter had the best of the early chances but once Gremio got started they were well on top. Gremio and Inter win virtually every year, so unless Inter can pull off a massive comeback, it's Gremio's to lose. Then again, it was Inter's to lose last season, yet in an absolutely seismic shock they lost to Novo Hamburgo, a modest team from the national Serie D who had never won a top-level championship before. That was the first team outside of the big two to win in 18 years. Novo Hamburgo didn't even reach the playoffs this year - quite an achievement, considering that 8 out of 12 teams in the top division make it there and Gremio/Inter both just play reserves for most of the dumb league stage. Brazil's Serie A kicks off in mid-April and offers a nice counterpoint during seasons with no summer competition. This year, of course, it will compete with the World Cup. Countries that play a (Northern hemisphere) summer season are at an inherent disadvantage if they have international-quality players. Brazil will probably call up three or four, as is their custom. Goal 648 for Cristiano Ronaldo there. Better than Pele's record, given that much of Pele's career was against complete dross in the Paulista. I scored an almost identical goal to that one in a recent dream. I assume the overhead kick and not the tap-in in the first half? I only saw the second half, was on the way to the airport in the first, but that was more than enough. I've been firmly on the Messi train until now but Cristiano is absolutely inhuman lately. Indonesia must be one of the biggest underachievers in world football. For a country of that size - over 260 million - that's absolutely crazy about the sport, they selcom qualify for anything, never even win their regional competition (the AFF Suzuki Cup, dominated by Thailand and Singapore) and their clubs tend to do badly. It doesn't help that they had two parallel leagues running for a few years due to political disagreements and mismanagement. Nonetheless, today they did manage to break a record. In the AFC Cup (their Europa League), 60,157 fans came to the national stadium today to watch Persija Jakarta thrash JDT of Malaysia 4-0. Former Vasas and Ferencvaros striker Marko Simic of Croatia got all four goals. There was also a great crowd for Al-Zawraa Baghdad against Al-Ahed Beirut in what was the first AFC club game in over 20 years to be played in Iraq. Unfortunately it couldn't be played in Baghdad itself, but there was still a great support in Karbala - considering it's over 100 miles from Baghdad and there were security checkpoints outside of the city, to get over 16,000 was amazing. Ahed got a late equalizer to stay top of the group ahead of the Iraqis, who are still favorites to go through in second place. Edited by TRVMP, 11 April 2018 - 02:52 PM. As much as I dislike CR7, what a penalty. Not always a fan of the Champions League but loved the latest round of return fixtures. Edited by HamCam, 11 April 2018 - 09:36 PM.